Peripheral arteries carry blood to the extremities, such as the legs and feet. When these blood vessels become clogged with calcium deposits it narrows the passageway. The medical name for this hardening of the arteries (arteriosclerosis) is Peripheral Vascular Disease (PVD) or Peripheral Arterial Disease (PAD). This condition decreases the blood flow to the nerves and tissues, affecting 8 to 12 million Americans with pain in the legs, ulcers, wounds that will not heal and even more serious health issues. PVD commonly affects the legs and feet first. Experiencing pain in the upper or lower leg while walking, even a short distance, may be the initial symptom. Slow or non-healing of wounds on the feet and legs may be another visual symptom. Vascular surgeons at Research Medical Center have many treatments available to help restore blood flow to the legs and feet of patients with clogged arteries due to peripheral vascular disease (PVD). To schedule an appointment with a vascular surgeon to learn more about diagnosis and treatment options or for a referral to a vascular specialist, call (913) 754 2800. If you have symptoms or are at risk for PVD, talk with your physician. After your visit, your physician may recommend you see a vascular surgeon and/or undergo testing to diagnose the lower extremity leg blockages. Testing may include an ultrasound or a diagnostic angiogram (an X-ray of the blood vessels after an injection of a radiopaque substance). Research Medical Center offers a number of different treatment options for restoring blood flow for patients with PVD. By discussing the benefits and risks of each option with our vascular surgeons, together you will be able to decide the treatment that best suits your needs. An angiogram, also called an arteriogram, is an invasive diagnostic test that uses x-rays to take pictures of your blood vessels. A long flexible catheter is inserted through the blood stream to deliver dye (contrast agent) into the arteries making them visible on the x-ray. This test can help diagnose clots and arterial stenosis (blockages). An angiogram is similar to an x-ray. Normally blood vessels cannot be seen in an x-ray, but adding a dye (contrast agent) into the blood stream makes blood vessels visible. To deliver the contrast agent, a catheter is inserted into the large femoral artery in the upper leg (groin area). The long, flexible catheter is threaded up through the artery to the point of the blockage. While viewing an x-ray monitor, called a fluoroscope, the vascular surgeon steers the catheter through the blood vessels. Contrast is injected into the bloodstream to make the blood vessels visible on the monitor. Vascular surgeons use an angiogram to detect problems with blood vessels such as arterial stenosis (narrowing of the arteries), a tumor, or blood clots. Angiography offers the benefits of combining diagnosis and treatment for patients who may need to undergo vascular surgery or a lower extremity revascularization procedure such as angioplasty or stent placement. After evaluating each patient’s situation, our vascular surgeons will determine which minimally invasive treatment option is best based on the size, location and type of blockage(s). Each technique involves a vascular surgeon making a small incision in the upper leg or groin area and inserting a catheter into the incision. If you are diagnosed with PVD which requires intervention, be assured that the vascular surgeons at Research Medical Center use the latest medical technology, including minimally invasive techniques. There are many patient benefits including: smaller incisions, less blood loss and less pain, fewer complications and faster recovery times. Research Medical Center vascular surgeons have many treatment technologies available to help restore the blood flow to the legs and feet of patients with clogged arteries from PVD. Specialist physicians consider the size, location and type of blockage(s) determine the best minimally invasive treatment option for each patient. All of these techniques use a catheter that is inserted through a small incision in the upper leg or groin area. A catheter is threaded up through the artery to the point of the blockage in order to inflate a balloon at the tip of the catheter that forces the plaque to the sides, opening the blockage. Vascular surgeons also offer atherectomy which is a minimally invasive surgical method of removing plaque from arteries or blood vessel within the body. These forms of angioplasty are used to effectively treat peripheral arterial disease of the lower extremities. Photo: Copyright © Nucleus Medical Media, Inc.
Angiogram: a type of X-ray that takes pictures of blood vessels with the help of contrast dye injected via a catheter. Arteriovenous malformation (AVM): a congenital disorder in which there is an abnormal connection between arteries and veins without an intervening capillary bed. 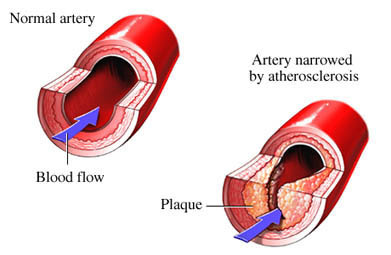 Atherosclerosis: A degenerative disease of the arteries in which fatty plaques and scar tissue form on the inner walls and block the free flow of blood. Catheter: a thin flexible tube made of rubber or plastic used to insert or remove fluids from the body. Contrast agent: a liquid (usually iodine or gadolinium) that is injected into the body to make certain tissues show up clearly during diagnostic imaging (for example: angiogram, CTA or MRI). Fluoroscope: an imaging device that uses x-ray or other radiation to view structures in the body in real time. This is also called a C-arm. Iodine: a non-metallic element used in contrast agent that makes vessels and tissues show up on diagnostic imaging (for example: angiogram or CTA). Radiologist: a doctor who specializes in reading X-rays and other diagnostic scans. Vascular Surgeon: a physician specialist trained in the diagnosis and management of diseases and conditions of the vascular system, arteries and veins. They are experts in medical therapy, minimally-invasive catheter procedures and lower extremity revascularization. X-ray: electromagnetic radiation used in diagnostic imaging to view shadows of tissue density in the body.